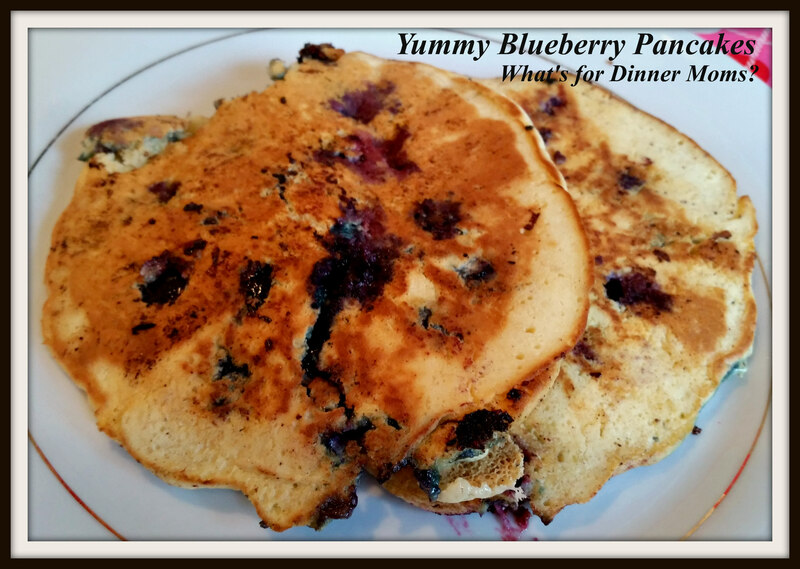 Yummy Blueberry Pancakes – What's for Dinner Moms? One of the last items left from our No Buy January was a bag of farm fresh blueberries from our Community Supported Agriculture (CSA) share last summer. My daughter had a friend spend the night over the weekend so I made blueberry pancakes for the girls to use them up! These were really good. I am not sure if it was the farm fresh blueberries or the hint of lemon but both girls ate four pancakes each. I made 2 extra for breakfast the next morning. These were 1/3 cup pancakes so they were really large and I added lots of blueberries. In small bowl mix half and half and lemon juice. In a larger bowl mix together flour, sugar, baking powder, and baking soda. To the milk and lemon juice mixture add egg and butter. Mix well. Slowly pour the milk mixture into the flour mixture. Stir until just the biggest lumps have been broken up. Batter will be lumpy. Melt butter in pan over medium heat. Pour 1/3 cup of batter into warm pan. Top with blueberries. Flip once the pancakes get very bubbly and brown on the bottom. Flip carefully with a large spatula. Cook second side until browned and cooked through. Serve immediately or keep in 170 degree oven until ready to serve. Previous Post Six Big Game Day Crowd Favorites! I have a large box of ready to cook pancake, and frozen blueberries in the freezer. I ‘ll cook as directed in the box and top with the blueberries. I hope it works. It should work fine. If you want add a bit of lemon juice to give it a fresher taste. Looks great. I love blueberry pancakes and wanted to make them this weekend but didn’t get to it and now am almost out of blueberries. We have just enough left for them with our oatmeal. Very sad day for the kids that our blueberries are gone. I always end up with frozen blueberries in the freezer in the middle of winter, and I just checked and yep, there are some in there. Good reminder to pull out the skillet soon for some blueberry pancakes! Thanks. Using up what I can now to get ready for new veggies and fruit in a few months. hi, nominated you for the blogger recognition award, totally up to you if you want to accept! Lol! My kids will tell you I usually make what are called “scrambled cakes.” My sister-in-law bought me a large, wide, thin metal spatula specifically for pancakes. This was my first real try with it and I love it! Ohhhhh thank you for teaching me your ways! I’ll have to look for one. Omg, I LOVE breakfast food. Thanks for sharing! Reblogged this on This Is My Ducking Life.